This is a rather curious CD, subtitled “Ramon Llull – chronicle of a medieval voyage: conversion, study and contemplation”. When I first saw the CD, with its mention of Ramon Llull (Raymond Lully), I wondered if this was a discovery of a previously unknown mediaeval composer. But it turns out the Llull/Lully has nothing to do with the music on the recording. The ‘bouquet of pieces’ on the disc are apparently an offering to the admirers of Llull on the 700th anniversary of his death. A rather curious offering, considering that for most of his life, Llull had little or anything to do with music, and certainly not for the sort of music on this CD. Llull was born in Palma, Majorca, around 1230, shortly after the Muslims had been conquered and enslaved, and the Balearic Islands had been absorbed into the Kingdom of Aragon under James I. After a youthful period of debauchery, sensual pleasures and profane love, he has a vision of Jesus on the cross, he was converted to a version of Christianity that encouraged the massed conversion of Muslims and Jews, to which end he encouraged the study of their languages in the emerging church-sponsored universities. He was rejected many times by the later mediaeval church, although he was beatified in the 19th century and is honoured as a martyr by part of the Franciscan order. He is one of those figures whose writings are acknowledged as an influence in a vast range of later thinking, including election theory, logic, computation theory, classification systems – and the concept of the Immaculate Conception. So much for Llull. The music is intended to represent the sort of music that was current in his time, bringing together generally well-known examples of mediaeval music in the period that saw the gradually development of polyphony. Llull criticised minstrels, so I rather doubt if he would have approved of some of the music recorded her. I also wonder what he would have thought of the enormous number of instruments used by Capella de Ministrers. More than 30 are listed, and with 11 players, that makes for a lot of collective noise, the very opening of the CD being a good example. This type of rather hectic mediaeval music performance was popular years ago, but I am not so convinced that it could still be regarded as ‘historically informed’. With so little real evidence of how musicians played their instruments, it is of course still a possible option, but endless heterophony and the anarchic clashing, banging and tinkling things does begin to tire after a while. The singing of the eight singers of Musica Reservata Barcelona is generally sound, with a few fine soloists balancing out some rather odd-sounding contributions. 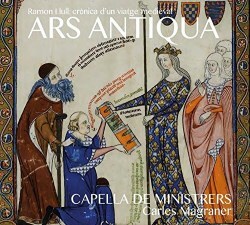 The CD gives no information about either group, although Capella de Ministrers have produced a vast number of recordings under their own label. With Llull’s interest in languages, I think he would join me in finding the English translations of the notes rather curious.